Above, Bishop Nicholas DiMarzio celebrates the Mass of installation of Father Joseph Fonti as the new rector/president of Cathedral Prep and Seminary, Elmhurst. Cathedral Preparatory Seminary began its history in the Fall of 1914 at the corners of Atlantic and Washington Avenues in Brooklyn. Founded as a preparatory high school, Cathedral was also a seminary – a place where boys who expressed at an early age a desire to discern a vocation to the diocesan priesthood would feel comfortable and encouraged. Originally, it was a six-year program, which included the first two years of philosophy to be completed in a six-year seminary program. For almost 100 years, Cathedral has stayed faithful to its mission: form the mind in the ways of academic excellence and the heart and soul in the ways of heroic virtue and belief. The program at Cathedral, vibrant since 1963 in its Elmhurst campus, continues to offer every young man in its care a personalized, academic education in an environment where he can grow in maturity and grace. Keenly aware of the challenges that we face as a Church and in the society in which we live, the Cathedral man is prepared to be both a gifted thinker and a generous servant. Whether its graduates don the vestments of pastoral service as priests or deacons in Brooklyn and Queens or serve their own individual family or the families in the community around them, the Cathedral experience is determined and dedicated to form men for greatness. 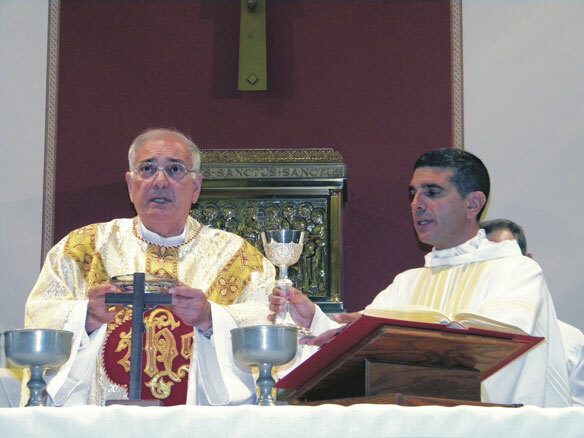 Recently, at the completion of the term of Father Fred Marano, the former Rector/ Principal, I appointed Father Joseph Fonti as the new Rector/President of Cathedral Preparatory Seminary. Father Fonti is well qualified, as he has his S.T.L. in spiritual direction, has been a pastor and most recently Assistant Director of the Sacred Heart Institute for the Continuing Education of the Clergy, as well as a spiritual director in the College Seminary. The appointment reflects the basic change that has occurred in that we have gone to a President/Principal model with Mr. Richie Diaz serving as principal, separating the responsibilities of these two roles. This change will allow Father Fonti to concentrate on the formation and external affairs of Cathedral. As clearly stated in its Mission Statement, it is not expected that every young man who enters Cathedral Preparatory Seminary would go on to the priesthood. Rather, formation and Christian leadership is important. In order to clarify this modification, the school will now be known as Cathedral Prep and Seminary. This new vision for Cathedral Prep and Seminary will include looking to improve the academic character of the institution, while at the same time concentrating in the last two years on a special tract for those who are seriously considering a vocation to the priesthood. In the last two years, perhaps a concentration on Latin is still important for work in the Church, as well as an introduction to Greek. Most important, however, is the spiritual direction given to these young men. Although some students discern to go on to other colleges, especially if they have received a scholarship to a college other than St. John’s University where most of our college seminary students attend classes, a new program of outreach with those who have gone on to other institutions but still may be discerning a vocation will be part of the responsibilities of Cathedral Prep and Seminary. Our program at Cathedral Prep and Seminary is also available to those in the Archdiocese of New York and also the Diocese of Rockville Centre. In the past, we have had students from both of these dioceses, and we will make a special effort of recruitment in the future. Another special aspect that we foresee in the future is a closer connection to parish life. A vocation to the priesthood cannot be discerned merely in a school setting. Rather, it must be discerned in practical and pastoral settings in the parish. At one time, pastors were required to sign report cards of all students attending Cathedral Prep. Perhaps some system of contact, short of report card signing, might accomplish what we are attempting in this important part of the process of formation. I was fortunate to have attended Cathedral College. I transferred from St Michael’s High School.in my second year of High School. Played on the baseball and basketball varsity and was fortunate to have played with Marty Bannon ( later a Priest) for the NYC Championship ( we lost) in a great game. After my second year of College at Cathedral I transferred to Fordham University and graduated in 1953. I served in the US Navy as a Naval Aviator for 5 wonderful years. Carrier Flying was exciting. Worked for IBM for 30 years and Ross Perot for 10. I married , had 3 wonderful children and am now retired living in Potomac md. Cathedral and what I learned there served me well.